There are some teams that whenever you play them, there is always something to talk about. 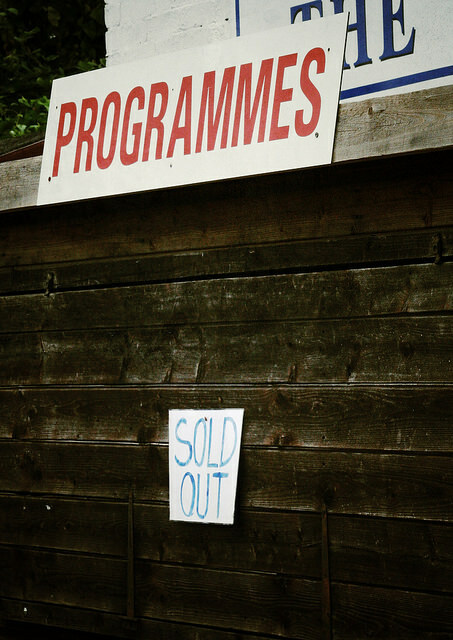 Games between Lewes and Hampton & Richmond Borough can never be classed as dull and today was no different. Just six games into the season and the game between The Beavers and The Rooks was already being classed as a “six-pointer”. Both sides found themselves in the bottom four coming into this game. That certainly wasn’t in the plan for both sides at the start of the season. But then again, if life was predictable, we wouldn’t need bookmakers. We’ve seen sending offs galore between the two sides, last minute winners, relegation-saving goals and strikes that would have won goal of the season if it was in the Premier League. Today, we would have swapped all of that drama for a dull 1-0 away win. Irrespective of the result, it would be one of the better away trips of the season. 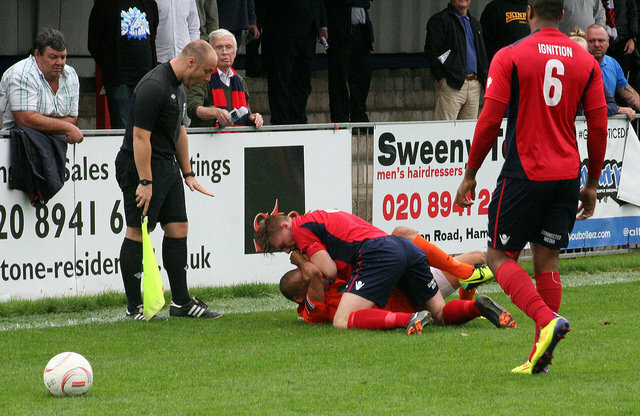 Hampton & Richmond Borough 2 Lewes 1 – The Beveree – Saturday 30th August 2014 In the past few weeks we’ve been left ruing some bizarre refereeing decisions that have had a direct impact on our poor start to the season. Today, once again there was some poor officiating although none of the decisions could be said to have ultimately impacted the result. The Rooks only came to life when Hampton & Richmond’s full-back Ben Osman was sent off for a second yellow with twenty minutes to go. Both sides looked nervous in the opening period with few chances on goal that worried either keeper. In fact the highlight of the first half was finding out they had garlic mayonnaise to put on the chips – such refinement is sadly lacking at Non-League grounds these days. But all of that changed within seconds of the restart when Lewes’s winger, Nick Wheeler was adjudged to have handled the ball on the edge of the area. Most of the crowd didn’t see the offence although the linesman was pretty quick in raising his flag. 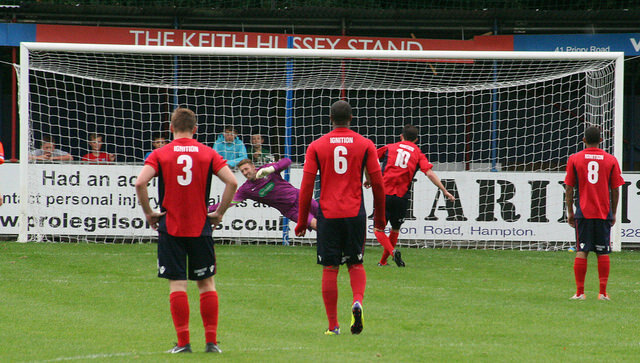 Of course it was Charlie Moone who stepped up and slotted the spot kick into the corner. Moone seems to have scored in every game he has every played against Lewes. In fact on the train on the way down I discussed the odds we could get on him as first goalscorer, that is if I was allowed to bet on football still. One became two soon after when left-back Wells was allowed to head home unmarked. The day was going from bad to worse. But then, a ray of hope as Ollie Rowe pulled one back and then Osman was sent packing. Could we fashion another dramatic result at the Beveree? Ten minutes later, Nathan Crabb got to the byline and pulled the ball back to Terry Dodd. Five yards out and Dodd managed not only to fail to hit the target but managed to clear the pretty high stand behind the goal. I repeat, from five yards. Hampton were now hanging on, although using as many time-wasting tactics as possible. Last season, the FA, under instruction from FIFA, instructed referees to only stop the game for an injury if it was clearly serious or a head injury. Yet today the referee kept stopping play every time a Hampton player rolled around on the floor. If we can be bothered to understand the rules then surely they can too. With a few minutes to go Elliott Romain was wrestled to the floor by Hampton full-back Wells. Then, right in front of the “assistant” referee, they had a tussle that quickly escalated to a 18 man brawl. The officials completely lost control of the situation and it took a couple of players from each side (one being the Lewes keeper) to restore order. Wells was yellow carded as too was Romain, yet the original offence was worthy of a booking alone. In which case, what exactly did Romain do? A picture tells a thousand words so make what you will of this… Alas, for all the bluster it wasn’t enough. A fifth consecutive defeat for Lewes was our reward for the long journey. You make your own luck in football, so they say but someone needs to tell us the recipe!